It will take off anything for about 2 cents per wash! . We have simply been unable to find anything the working person gets their hands into that Frontier Hand Scrub With Power Scrubbers can't remove; tar, asphalt, grease, oil, bondo, glue, adhesives, paint (wet or dry), printer's ink (that's what it was designed for), etc... Frontier Hand Scrub With Power Scrubbers contains absolutely NO petroleum OR citrus-based solvents of any kind in the formula. Don't be fooled by other hand cleaners that offer "clean citrus" formulas. All they do is substitute d'limonene (turpentine made from orange peels) or some other harsh chemicals which are terrible for your hands. Frontier Hand Scrub With Power Scrubbers is so concentrated, a thimble-full or less will remove anything from your hands. You will get approximately 300 hand washes per pound of Frontier Hand Scrub With Power Scrubbers! That works out to about 2 cents per wash, saving up to 58% compared to most brands on the market! GOJO, DL, Loyal, Zep and most average waterless and non-waterless hand cleaners range in cost from 8 to 12 cents per wash! A common problem with most hand cleaners is costly overuse! Frontier Hand Scrub With Power Scrubbers is so concentrated that if you try to use too much, you'll spend longer and longer rinsing it off your hands, thus defeating the purpose of overuse in the first place. 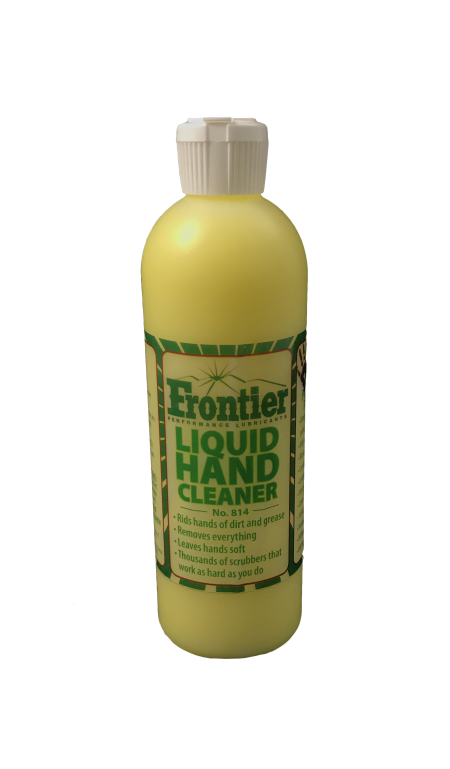 Frontier Hand Scrub With Power Scrubbers is simply the best self-regulating hand cleaner on the market!